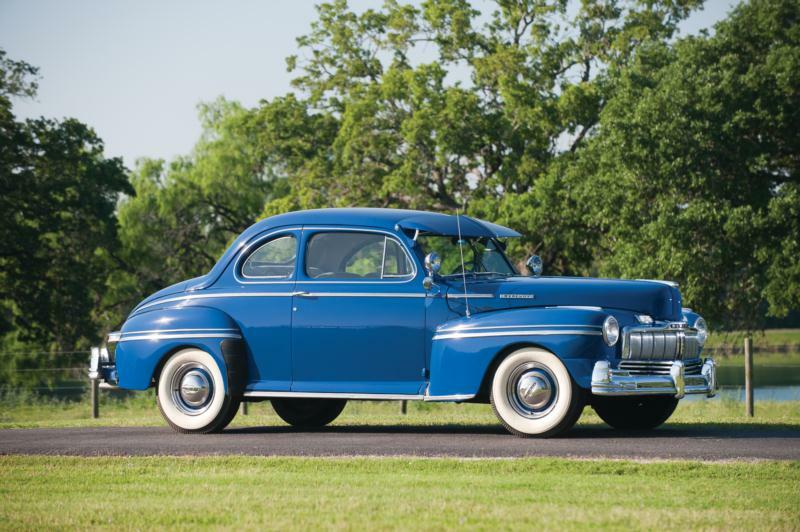 Mercury received all new, true postwar styling starting with the 1949 model year, and nearly everything was changed when compared to the 1948 models. The cars were swoopier and sleeker, wider and lower, and had a completely new front look. Furthermore, they were no longer dressed-up Fords, but instead stand-alone designs that shared as much with Lincoln as with Ford’s model line. Pricing was aimed at the mid-market consumer, with a standard coupe costing just under $2,000. This was competitive with offerings from Buick, Oldsmobile, and Chrysler, and DeSoto. In addition to a new look and identity, the Mercury engine grew in displacement to 255 cid, and horsepower grew from 100 to 110. The suspension set-up placed coil springs in the front and leaf springs in the back. Shifting was handled via a 3-speed manual transmission, with an optional overdrive unit available. Body styles included a coupe, a four-door sedan, a convertible, and a woody station wagon. The early introduction of the new Mercurys meant there was a long sales window for the model year. Even still, more than 300,000 models were sold in 1949, far surpassing the three previous model years combined. Mercury made only minor adjustments in 1950, with some trim differences from the previous year. A low-priced coupe joined the lineup, as well as Mercury’s first hardtop design, the Monterey. A 1950 Mercury convertible was chosen as the Indy pace car. Again, nearly 300,000 Mercurys sold this year. The most notable change for the 1951 model year was the introduction of Merc-o-Matic automatic transmission, which brought the brand up to speed most of the rest of the Big Three. Horsepower changed nominally from 110 to 112, and exterior styling changes included reshaped rear fenders and rear glass. The Monterey could now be ordered with a leather-covered hardtop as well as last year’s cloth-covered hardtop. Ford restyled its Mercury lineup for the 1952 model year to build on its postwar momentum, and the next generation would continue to enjoy success in the showroom. It is the 1949 to 1951 group of cars, however, that can largely be credited with jumpstarting Mercury’s newfound image. Early 1950s Mercurys are a good bet for a starter collectible, being usable daily drivers with good colors and modest proportions when compared to later years. The car’s mechanicals are straightforward, though some trim pieces can be hard to source. They sold well in their day, but originality can be a challenge now since early Mercs were popular choices among period hot rodders.